Being a global modeling platform provides huge benefits for our users. A lot of features that we develop improve our global platform and are available for every model type. Well documenting your models is considered a good practice. Up until now, we provided a basic editor for documentation. It did the job, but we thought it wasn’t quite up to the high standards of quality we set for our platform. 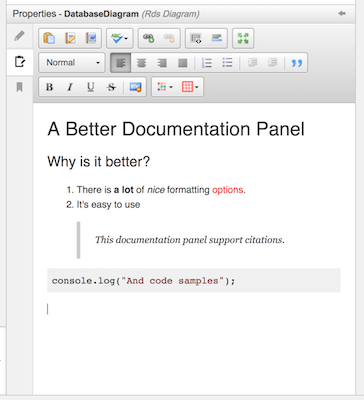 That is why we introduced a new Documentation Editor. We save your documentation as HTML in the model, ensuring easy reuse. For example, we provide UML and BPMN PDF report generation. Your model elements documentation is included in them with preserved formatting. Having an effective collaborative modeling tool means your diagrams can become very big, very fast. You can always zoom out to get a global view of your diagram. But zooming out, and in, again and again, isn’t really convenient. We took a look at the issue and decided to add an Overview of your current diagram to the Editor. The Overview let you keep an eye on your whole diagram easily. It displays a simplified version of your diagram. It’s zoom level automatically adjust to display your whole diagram. A rectangle shows you on which part of you are diagram you are working. You can drag and drop it to quickly move in your diagram. Since it’s inception GenMyModel element positioning was based on a grid. While grid is an easy positioning solution, it is not really convenient to use. GenMyModel now supports aligning elements relatively to each other. When you move an element, magnetic blue lines will appear to guide you. These lines help you align element centers or sides quickly. This also works when you create an element using the quick tools around the elements. With this feature, you can get a nicely organized diagram in seconds. As always we also kept improving performance on big models. The editor loads faster on them, and moving elements around should be snappier. Our online BPMN modeler gained a great addition. 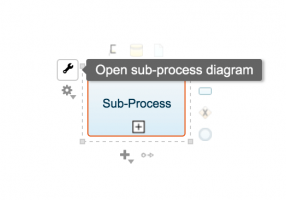 It is now possible to attach a diagram to a Sub-Process in your diagram. To do this, simply select your Sub-Process and click on the wrench. A new diagram will open, the root of this diagram will be your Sub-Process. In the future to reopen this diagram, simply reselect your Sub-Process and click on the wrench. The same diagram will open. It’s possible to easily convert a selection to an open Sub-Process. While you are modeling, it might happen that you forget to insert a task B between two tasks A and C.
You could, of course, delete the sequence flow between A and C, create your task B, then link A and B and B and C. But this sounds like a lot of steps for such a simple task. Well, now you can do better. Simply select the task tool, and click on the flow between A and C. This will automatically create your task B and link A to B and B to C.
A new feature was also added to our RDS modeling tool. When designing your RDS, you want not only to think about the structure but also the performance. Indexes let you give direction to your SQL engine to improve that performance. This very important part of RDS modeling has now been added to our RDS tool. 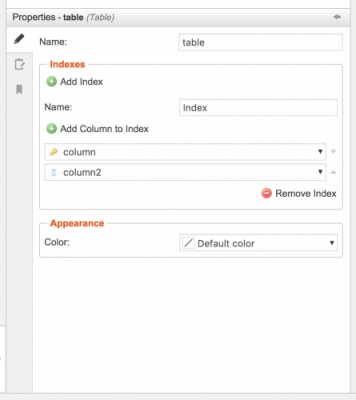 So how to create indexes on your Table? It’s super easy. Select any table in your diagram. Then in the property panel, click on the “Add index” button. A new index appears. You can change its name, and add columns to it with autocompletion. Couldn’t be more straightforward right? When you make a model on GenMyModel, you are not creating a simple drawing. GenMyModel understands the underlying model behind your diagrams. We have improved all those code generators to integrate Indexes. If you wish to you can duplicate and customize any of the provided generators to suit your needs. All of this directly from your browser of course. Your custom generators will also be available to any collaborator in your Organization. This ends our recap. We will keep working hard in 2017 to take your favorite modeling tool to the next level. We have a lot of projects for this year, so stay tuned and make sure to follow us on Twitter and Facebook. The whole GenMyModel team wishes you a happy new year!